Spring is the season of flowers, rebirth, planting, and so many other wonderful things. I’ve also come to notice that it’s the season for people to talk about bees. As a forager, a gardener, and an environmentally concerned citizen of the planet, I am very happy when the general public also remembers that bees are important. Since they play a key role in most of our food production, bees and other pollinators are vital to our survival so we are right to be concerned about protecting their food sources and habitat. This concern for the bees gets demonstrated in all sorts of ways. Just today I was shopping and samples of Honey Nut Cheerios were being given out (very difficult to eat that sample as you’re pushing your shopping cart), along with packets of sunflower seeds to plant to ‘save the bees’. They even changed the design on their box to show a blank silhouette where the cartoon bee would be, to remind you that your beloved breakfast cereal is dependent on the bees not going missing. This is all well and good - even practical by giving out the sunflower seed mix to plant. The most common thing I’ve noticed these days is that people demonstrate their care for the bees in the same way they do for almost everything else: hitting ‘share’ on a Facebook meme. This concern for the environment is great, but can we find better ways of expressing it than just sharing a Facebook post? I see this kind of thing all the time for all sorts of issues - and occasionally I’ll share some things that I find important too - but I hope that I can also say I’m working in other ways to make a positive change in my world than just clicking one button online. In the end, I do hope that people are discouraged from spraying weed killer, and if the Facebook posts are helping that’s great. There has been an offshoot of this making it’s way into conversations about foraging. I still have so much to learn about foraging, but over the past few years the humble dandelion and I have developed what you might call a relationship. We’re both descended from European transplants, and have naturalized here in North America. I let them grow in/near my garden, and they grow huge (I take care of my soil) and feed me. You can eat the entire plant from flower to root, and it’s all delicious. I’ve written here about using them in pesto, and also adding them to egg noodles. All this doesn’t even mention the role they play in bringing beneficial insects to my plants. Basically, I love the dandelion. It really might be my favourite plant. Bracelet is the sterling silver spoon bracelet from my shop. There is a ‘rule of thirds’ in foraging - meaning that you take no more than a third of any given thing when you find it, and leave the rest to serve it’s purpose in nature. Exceptions would apply for invasive species (take it all), and the rare ones (take none). This sometimes gets combined with the advice about leaving the dandelions unsprayed for the bees, and people get very vocal (usually on the comments section on social media and blogs) about making sure you leave some dandelion blossoms for the bees when you pick some for yourself. While there is nothing really harmful in this advice, I maintain that - for dandelions - it’s not really necessary. Dandelions are by no means the first or only food for bees in early spring. Here in Kamloops they are only just blooming, but the bees have been out and about foraging for a few weeks already. Don’t forget that dandelions are imports from Europe, so before they were here the pollinators had to have something available to survive until settlers brought them over! 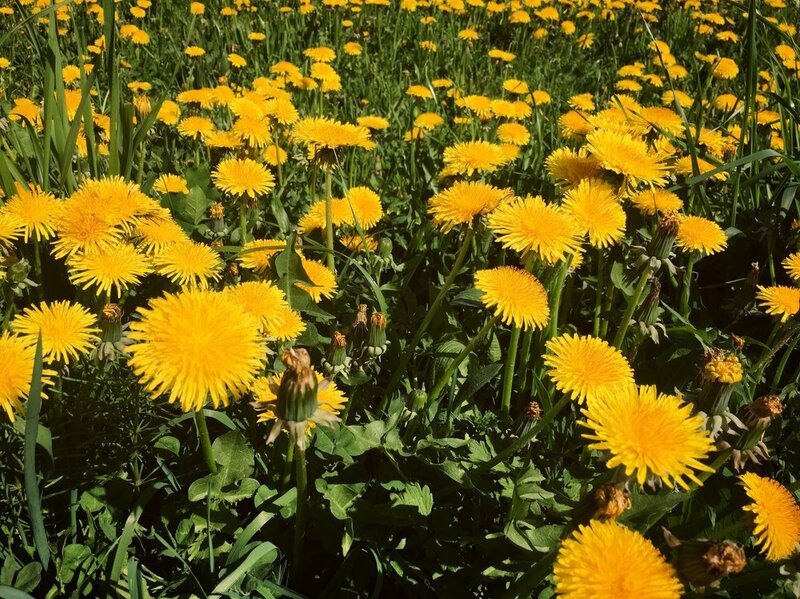 Dandelions are plentiful, and definitely valuable for many insect species (not just bees), but you’re not going to endanger the bees by picking too many of their blossoms. They also have a very long blooming season, and send up several flowering stalks at a time so even if you did pick every blossom you saw another would be waiting to shoot up and replace it. I also don’t appreciate adding unnecessary barriers to people enjoying the nature around them. Dandelions are easy to identify and have no toxic lookalikes, so I like to encourage people who want to learn about foraging to start there. I wouldn’t want them to read one of those comments and feel unsure of whether or not they should pick them. If those Facebook memes convince people to appreciate this amazing little plant that is awesome. Please don’t take this to mean that I approve of people using broadleaf herbicides on their yards. I just like to correct misinformation where I can. I also feel that encouraging people to eat the dandelions will discourage them from spraying them. I’ll leave you with some encouragement to pick and eat dandelions without worrying about if you are destroying a fragile ecosystem. Enjoy them! They are as healthy and delicious as they are cheery and bright.